In a perfect world, every member registers cleanly and successfully. Every player they've nominated is in the right age group, playing for the full year and has been charged the right money. Happens all the time, right? It can be a nightmare post-registration. Pulling players out, adding forgotten children in, combining registrations and then trying to work out how much they should be charged. In the first couple of years of the system, this was still a challenge. We've always let you do adjustments, but you've had to do the complex math to work out the totals of that adjustment. We've attempted to make our smart system even smarter. We bring you......recalculation of registration adjusting. When viewing a registration, there is now a new link as depicted below. Work out how much raised debt there has been for the registration (original invoice + debit adjustments). We then factor in raised refunds and applied credits. These adjustment instruments work to effectively "lessen" the amount of debt. That gives us the balance of the original registration (Current Debt Balance). As a second step, we pick up the registration in its current form (players with their current playing groups) and run it through the custom fee calculator that we built for your club. It once again looks at your current fee package amounts and factors in levies and family discounts. This would have happened originally at the checkout, but we do it again with the current state of the registration. This gives us a second amount to work with (Calculated Registration Debt). We compare the Current Debt Balance to the Calculated Registration Debt. If there's a difference between the two, we give you a "suggestion" on how to adjust the Current Debt Balance to make it equal the Calculated Registration Debt. If you accept our suggestion, the system creates the adjustment(s). A playing group has been changed for one or more players. One or more players has been added to a registration. One or more players has been removed from a registration. Two separate registrations have been combined into a single one. 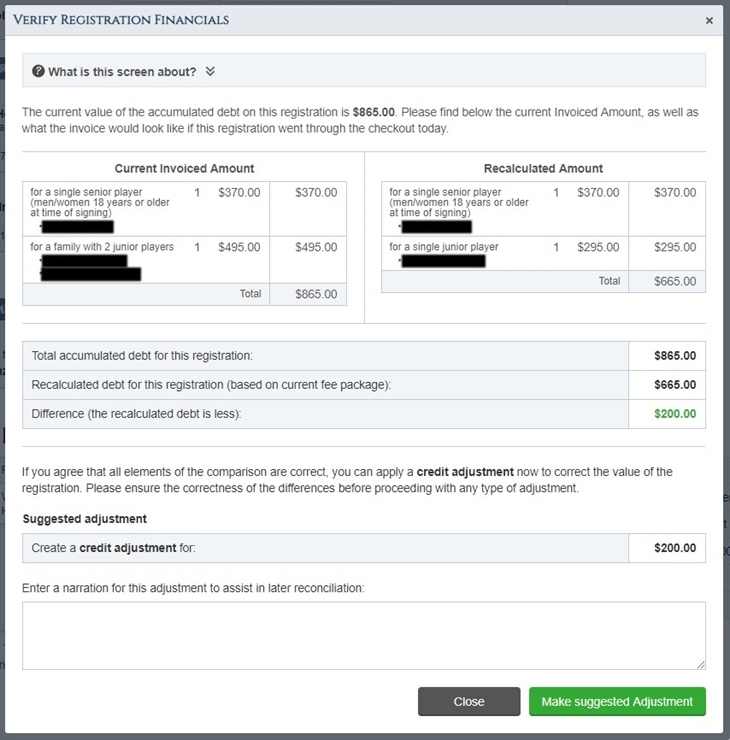 Fee amounts have been altered at some point (normally because an incorrect amount was entered) and you would like existing registrations that were charged an incorrect amount to be recalculated and adjusted with the corrected amounts. Any of these actions would mean that if the registration was taken back through the checkout, that a different amount would be calculated by the custom fee calculator that we've built for your club. This is where this recalculation function can step in and lay out how to get from the original amount to the newly-calculated amount. This takes the form of a "suggestion" by way of a financial adjustment. If accepted, the system will create the adjustment on your behalf. When shouldn't I use it? If you're already applied an adjustment to a registration without using this function, then it's probably best not to start using it. This function doesn't have any context as to adjustments already raised, so if your adjustment was of a discretionary nature, then you could really get confused by the "suggestions" that come out. A retrospective volunteer discount in the form of a credit or refund. A beneficent gesture by the club in the form of a credit or refund. Increasing a debt to accommodate some previous debt. The recalculation function cannot associate any meaning to these types of adjustments, so the suggestion will be that somebody has paid too much or too little, even though you know that this is not true; the function only cares about the aggregated debt on the original registration and the newly-calculated debt back against the fee package. As powerful as this function is, it isn't the most straight-forward thing we've ever built. It's a tool that can save a lot of time and brain-power, but it can take some time to understand what it does and when to use it. In the early days of looking at it, send us an email and let us know which registration you're thinking of trying it out on. We'll tell you whether it's a good candidate and why. You'll soon get the hang of it. The recalculation says that money is owed, so a debit adjustment is suggested. The recalculation says that the member has overpaid, so a credit note and/or a refund may be suggested. If you accept the system's suggestion, it will go ahead and create the adjustment(s) on your behalf. The screen below shows an example. Be sure to add a note explaining the reason for the change, for future reference/review. If the registration you are looking at already has manual adjustments that have been made, then it may not be obvious as to what the pattern of the suggestion is. Try to limit the usage of this function to the more straight-forward examples, where you're starting from just the initial debt, and if you think you've overdone the adjustments, contact us at support@majestri.com.au and we'll help you clean things up.